Click on one of the thumbnails below to access the 60 photos of this aircraft. Post war crew of Lancaster FM213 at Torbay in 1958. Left to right: Russ Morefield, Don Reynolds, John Caron and Cy Dunbar. 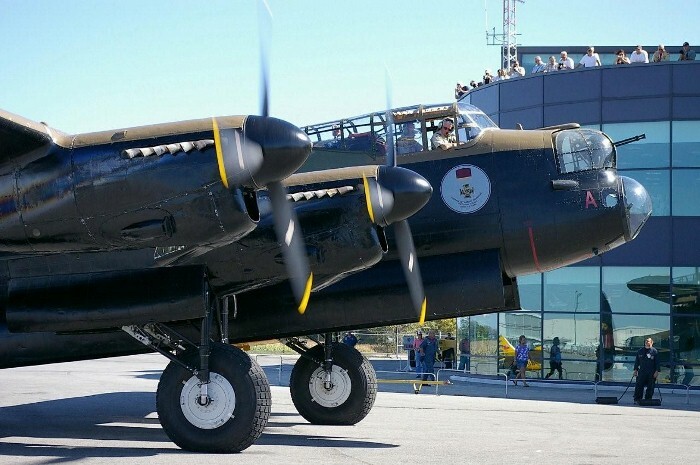 Cy also flew the Lancaster in Canadian Warplane Heritage Museum service. 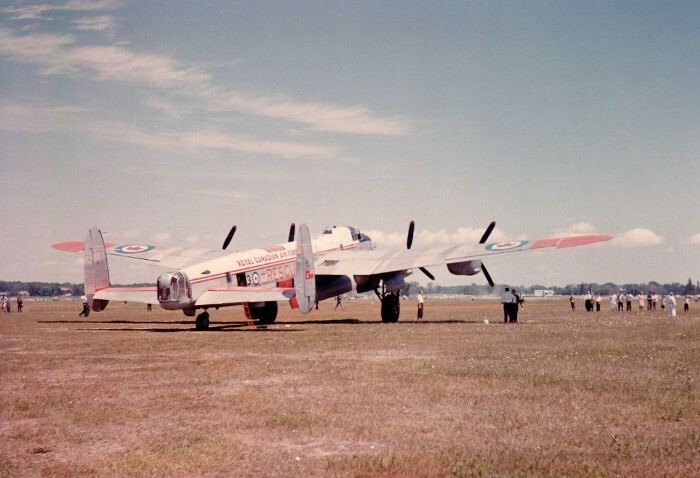 Lancaster FM213 shortly after a bad landing in Trenton in January of 1952. The damage to the centre section was severe and could have been considered unsalvageable. 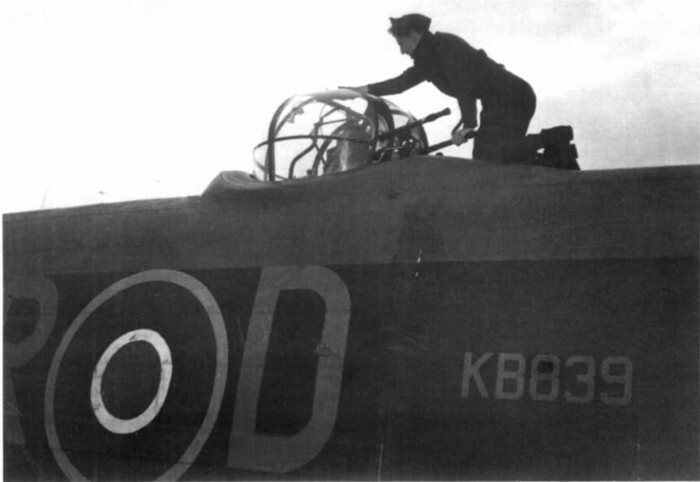 However, the aircraft had only 10.5 hours of flying time so repairs were completed by replacing the centre section from Lancaster KB895. 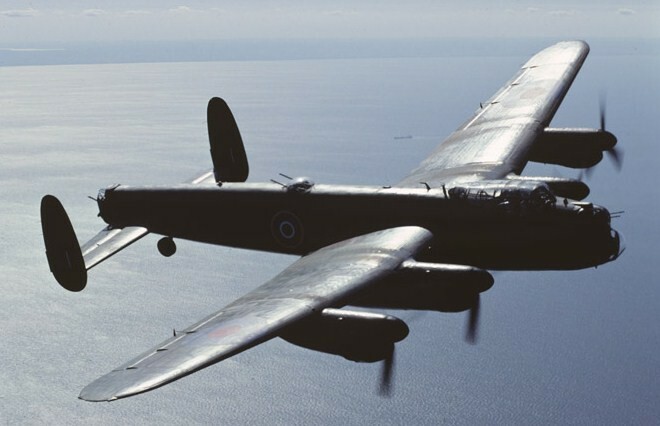 Lancaster FM213 flying off the coast of Newfoundland. 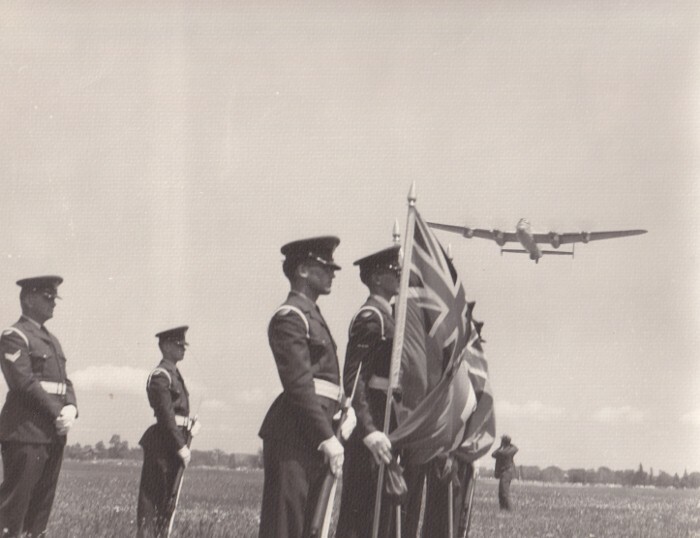 Lancaster FM213 flyover at Goderich in 1964 on what was thought its last flight. 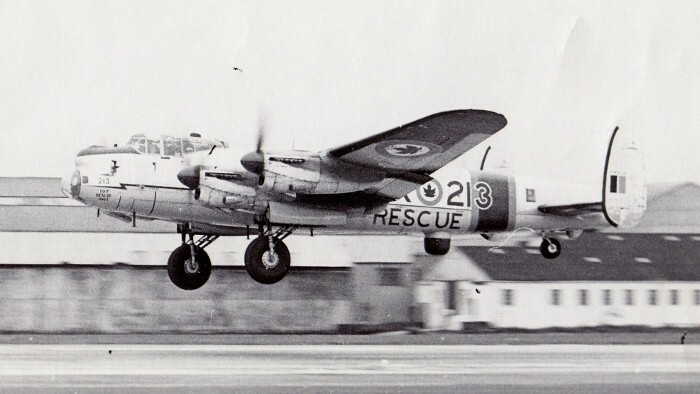 Lancaster FM213 shortly after landing at its new home in Goderich in 1964. 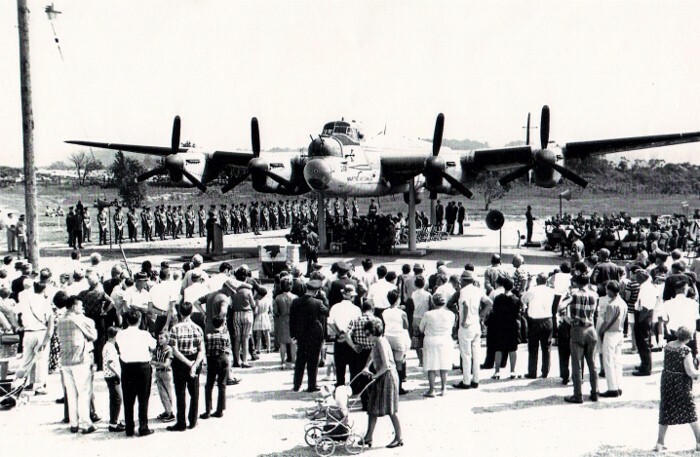 The dedication ceremony at Goderich for Lancaster FM213 on September 15, 1968. 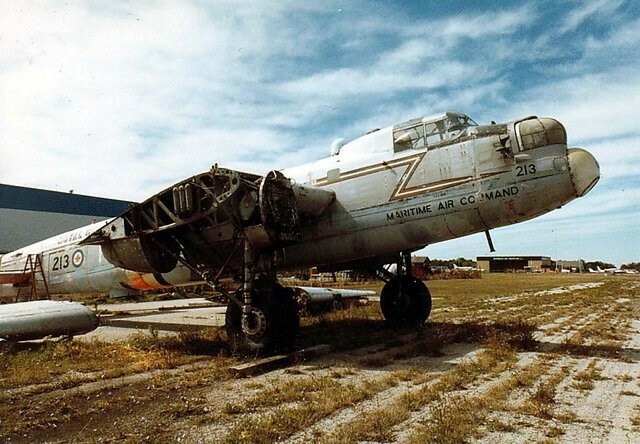 During the years Lancaster FM213 was on the pedestal, it suffered from normal deterioration and vandalism. 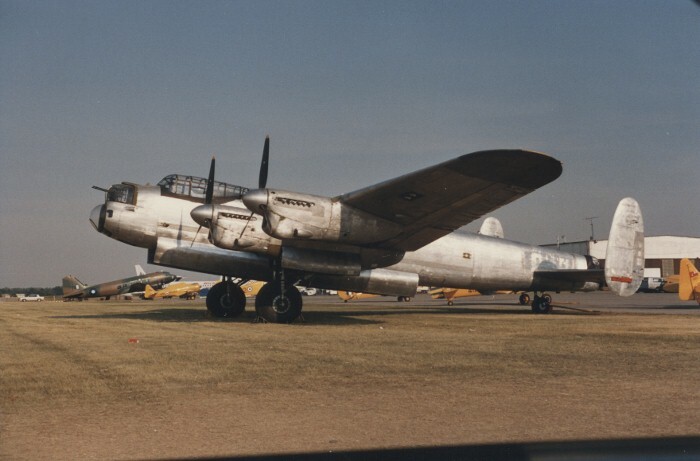 Lancaster FM213 was donated to the Museum in 1977 and it was removed from the pedestal. 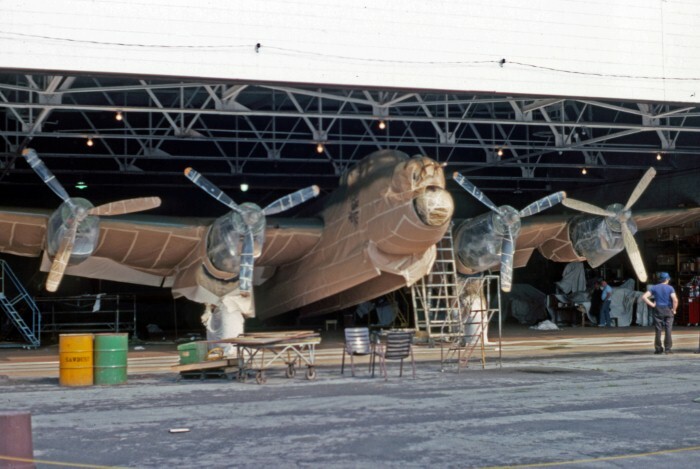 Removing the propellers and engines of the Museum&apos;s Lancaster in the winter of 1977 /78. 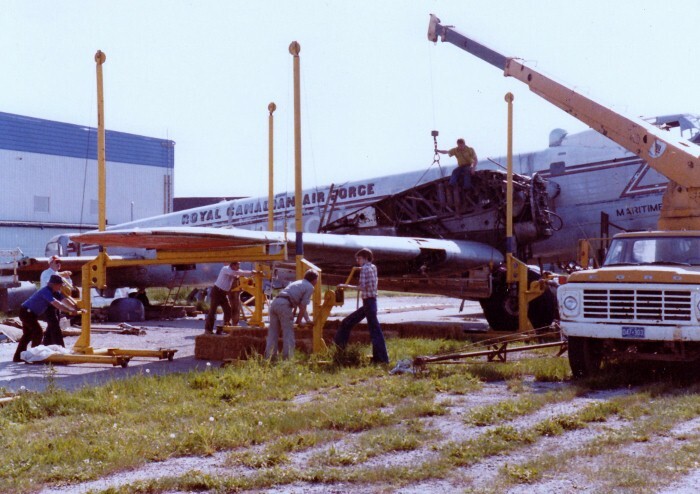 Removing the wings of the Museum&apos;s Lancaster during the spring of 1979. Lancaster FM213 stripped of as much weight as possible awaiting transport to the Museum. 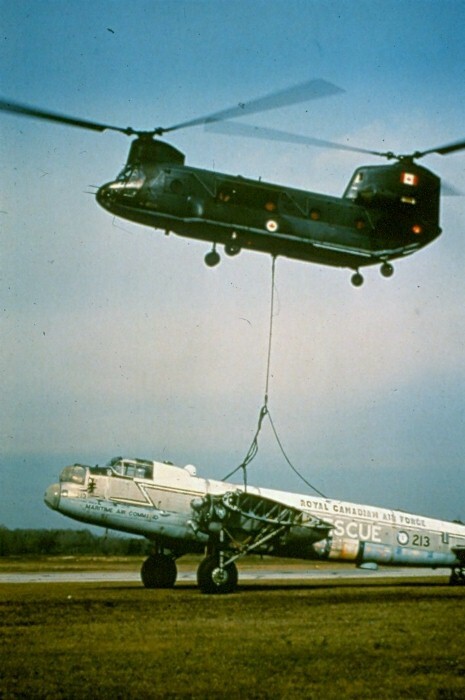 On November 5, 1979, a CAF Chinook from 450 Squadron in Ottawa piloted by Major Ed Booth and Captain Yves Lemieux delivered the Lancaster fuselage to Hamilton. After an initial unsuccessful attempt in June, longer slings were used this time and in the process, the flight set a world record for helicopter lift and distance. 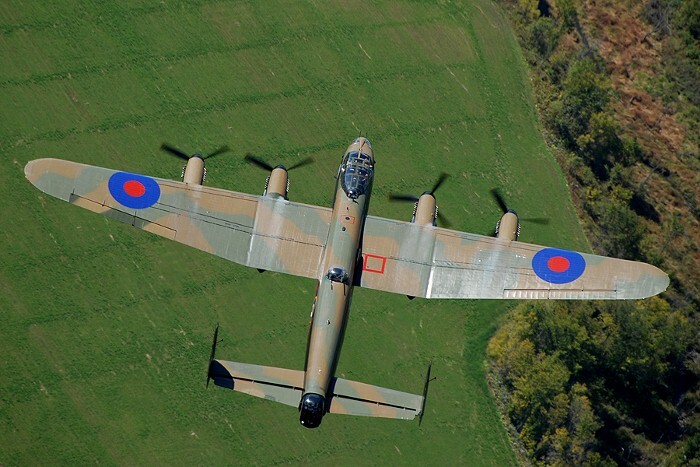 The task of restoring the Lancaster to flying condition seemed enormous considering the shape of it. Many believed it wouldn&apos;t happen. 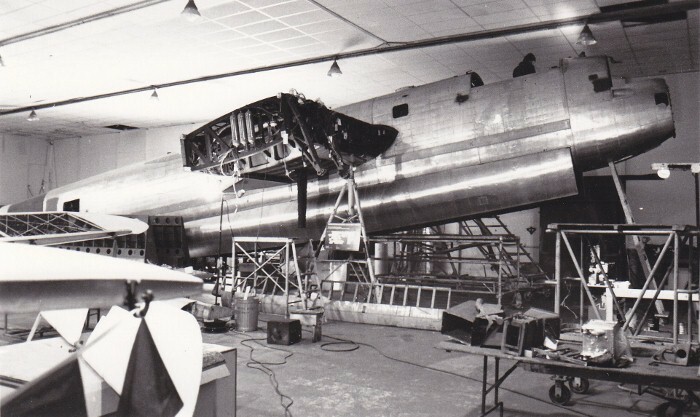 Restoration of the Museum&apos;s Lancaster surprisingly included wood work of the fairing for the rear turret. 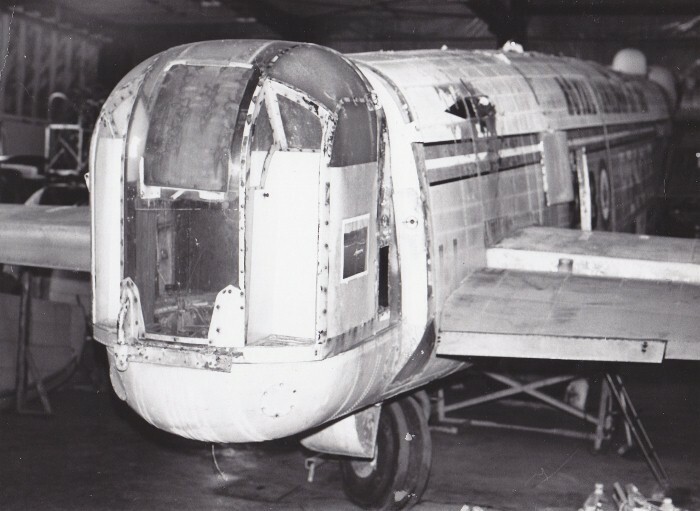 Restoration continues - the fuselage is stripped and on jacks. 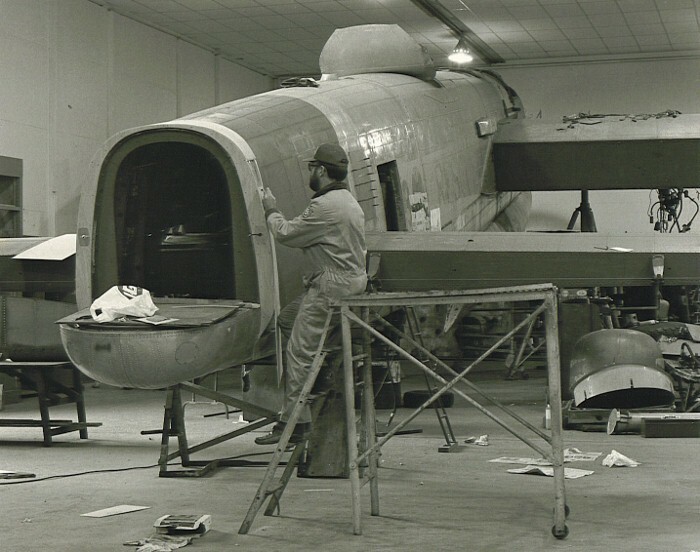 Restoration continues - the Lancaster is starting to come together as displayed at the 1985 Hamilton International Air Show. 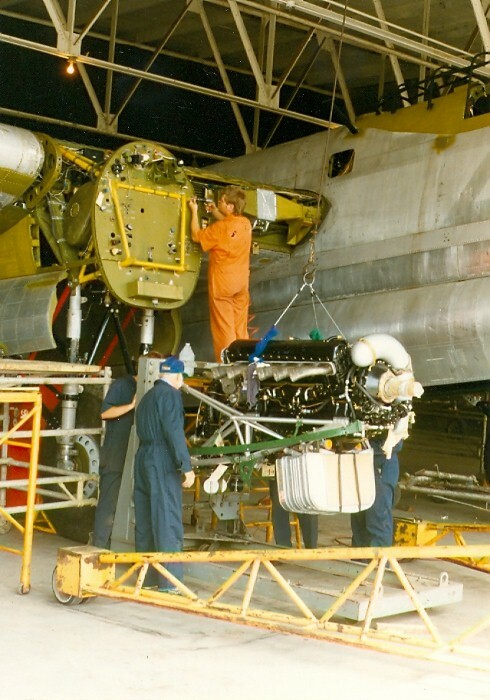 The first overhauled engine arrived at the Museum in April of 1987. 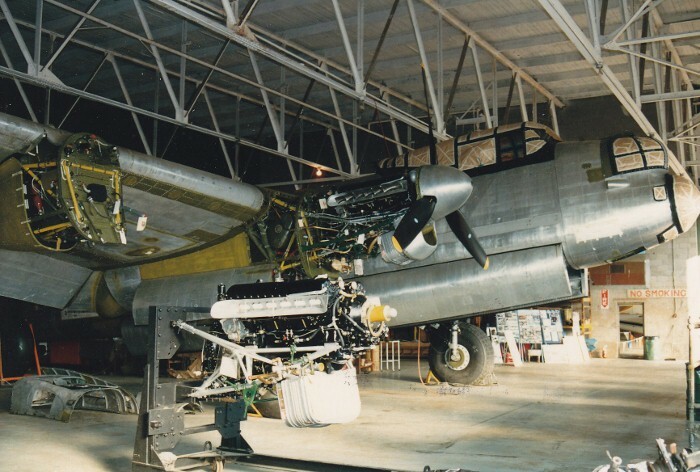 A major accomplishment in the restoration - the first engine installed on the Museum&apos;s Lancaster. 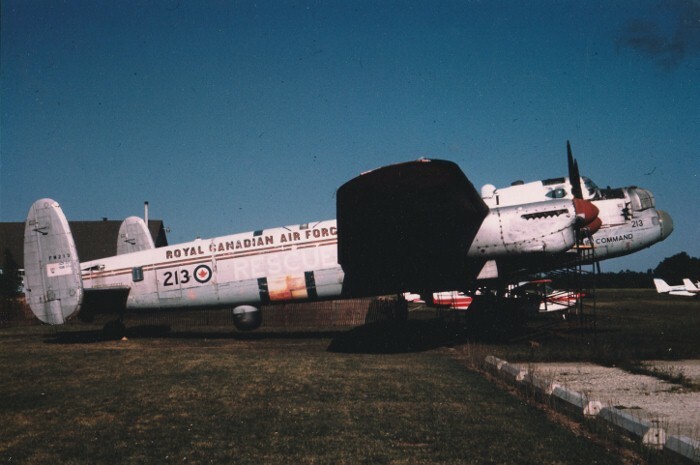 The nearly completed Lancaster with all four engines hung just in time for display at the 1988 Hamilton International Air Show. 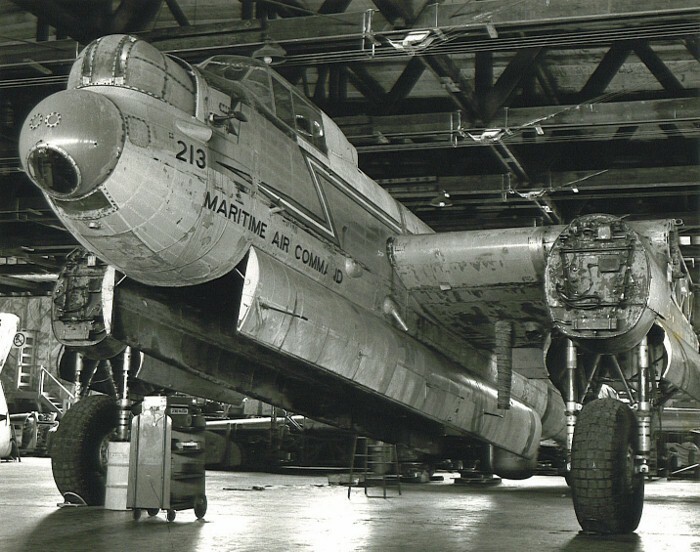 During the summer of 1988, the Museum&apos;s Lancaster was transformed into the Mynarski Memorial Lancaster. It took 351 litres of paint, 2286 meters of masking tape, 48 rolls of 2" masking tape & 48 rolls of 3/4" masking tape. The actual painting took 43 hours. 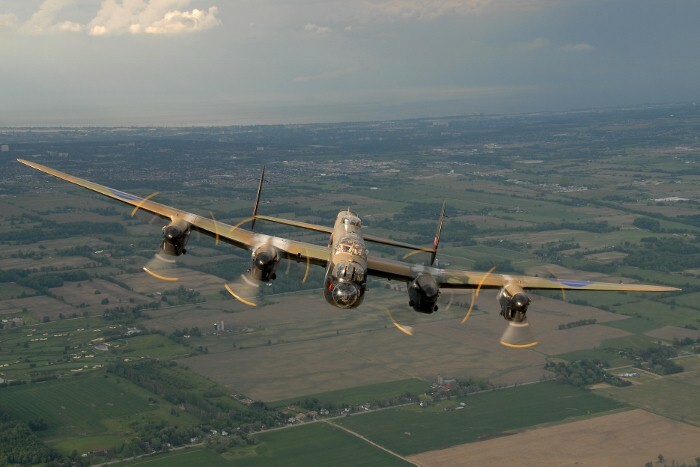 The Lancaster&apos;s first official flight was on September 24, 1988 at a special airshow in its honour. 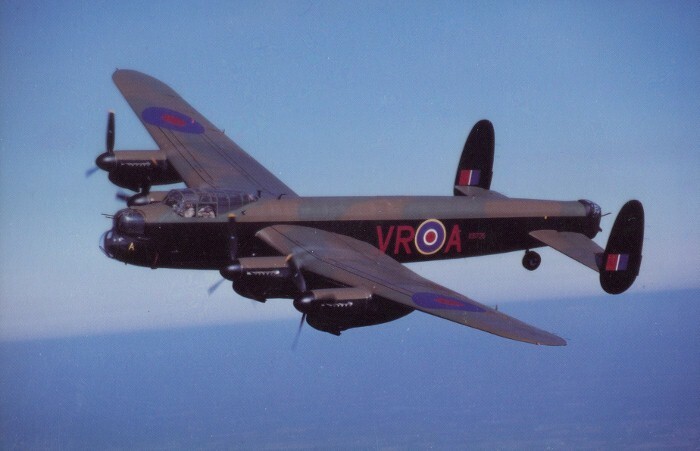 Initially, the Lancaster was flown without the mid upper turret being installed and the "A" on the nose was in yellow. It was changed to red after KB726&apos;s original crew pointed out the error. 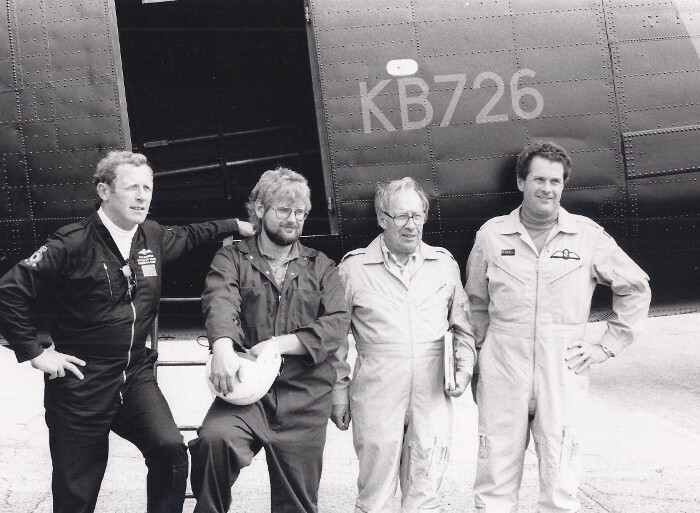 The crew for the first post restoration flight on September 11, 1988. From left to right: Tony Banfield, Tim Mols, Norm Etheridge and Bob Hill. 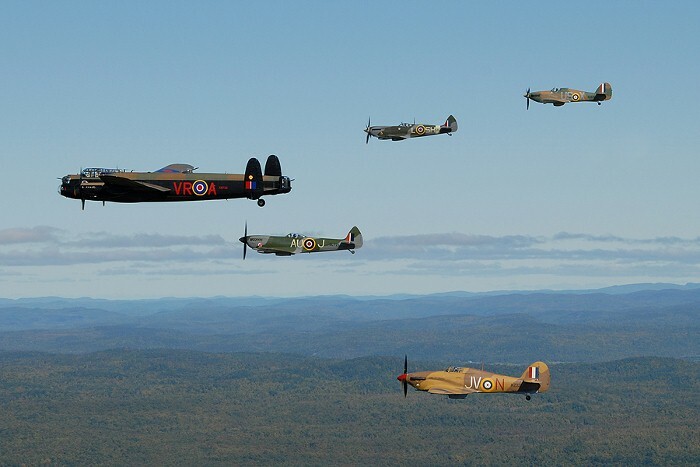 Tony Banfield, former Commanding Officer of the Battle of Britain Memorial Flight, travelled from England to do the first flight. 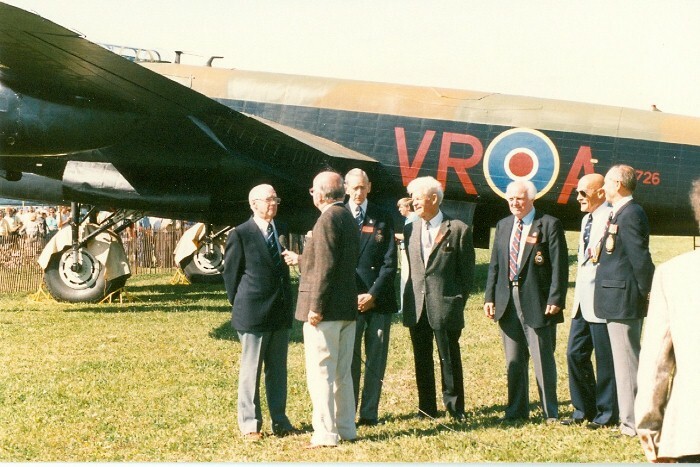 The original crew of Lancaster KB726 were on hand to see the Museum&apos;s Lancaster fly at its first public display on September 24, 1988. 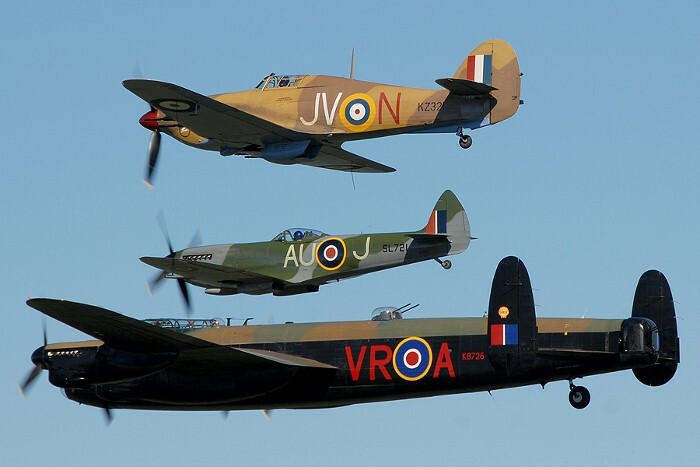 Lancaster KB726 accompanied by two Spitfires and two Hurricanes. 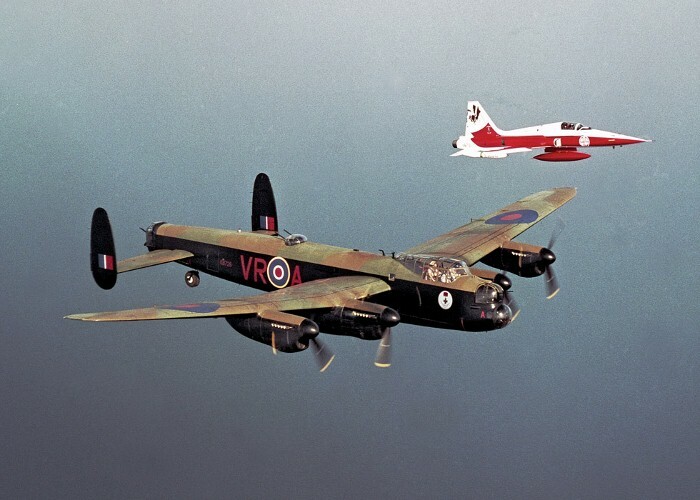 Lancaster KB726 and 419 Squadon colours CF-5. 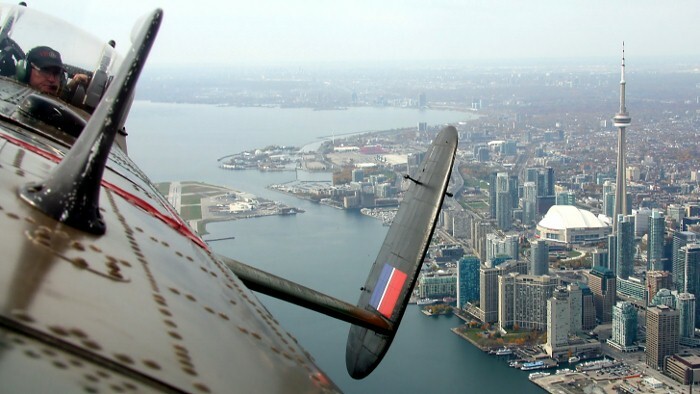 Lancaster KB726 as it flies by the CN Tower in Toronto. 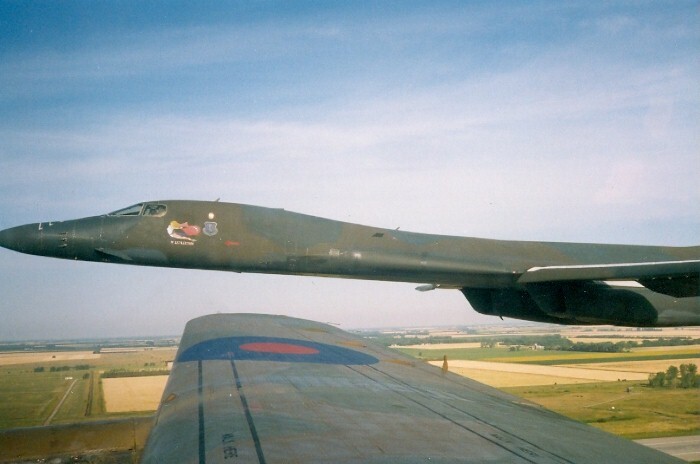 A USAF B-1 tries to keep up with Lancaster KB726. 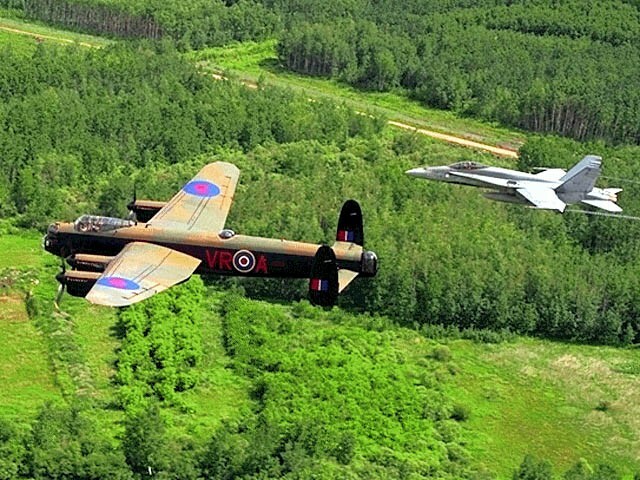 Lancaster KB726 and CF-18 Hornet. 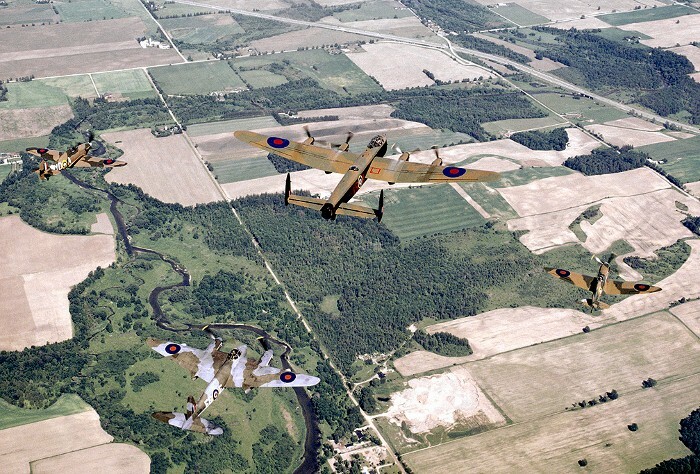 A rare sight - Lancaster KB726 accompanied by a Spitfire, Hurricane and Mosquito. 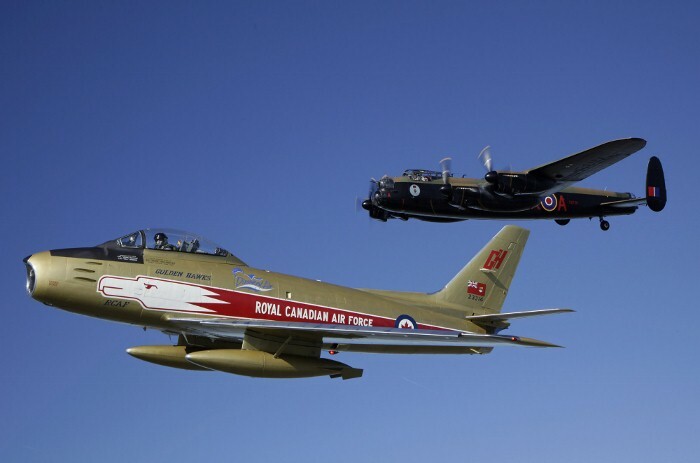 F-86 Sabre and Lancaster KB726. Lancaster KB726 and B-17 Flying Fortress. 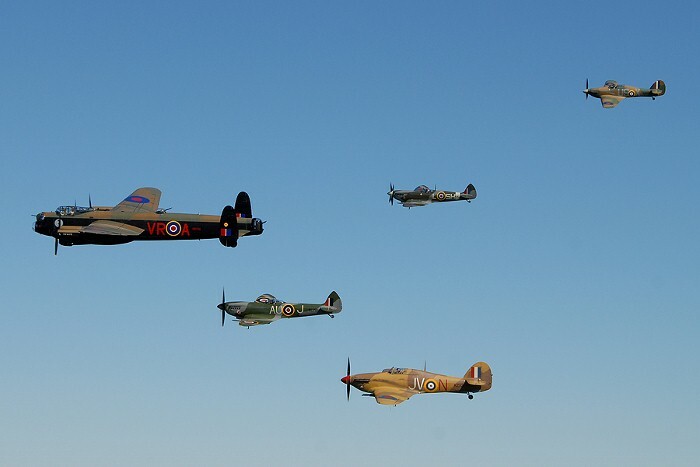 Hurricane, Spitfire and Lancaster KB726 in tight formation. 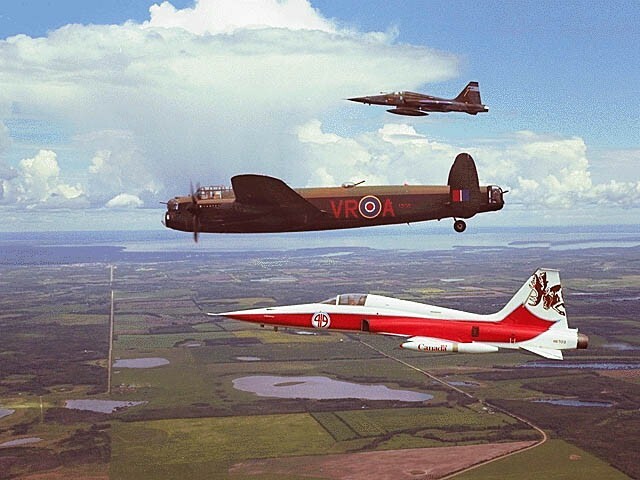 Lancaster KB726 accompanied by two CF-5s including the 419 Squadron colours aircraft. 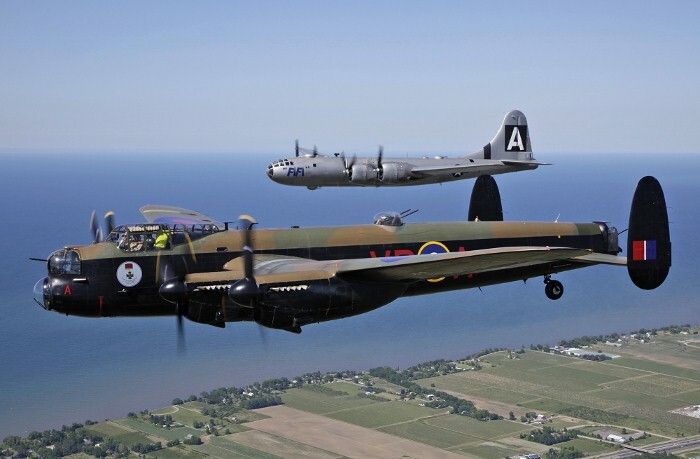 Lancaster KB726 and B-29 Superfortress. P/O Andrew Mynarski, Victoria Cross recipient. 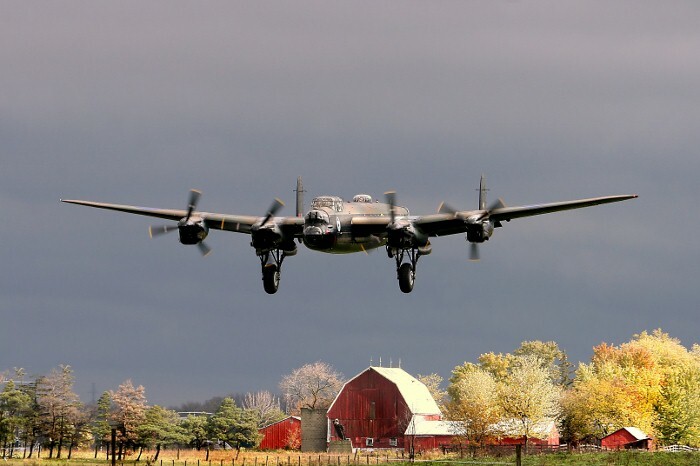 Probably the most famous Allied bomber of the Second World War, the Avro Lancaster had impressive flying characteristics and operational performance. 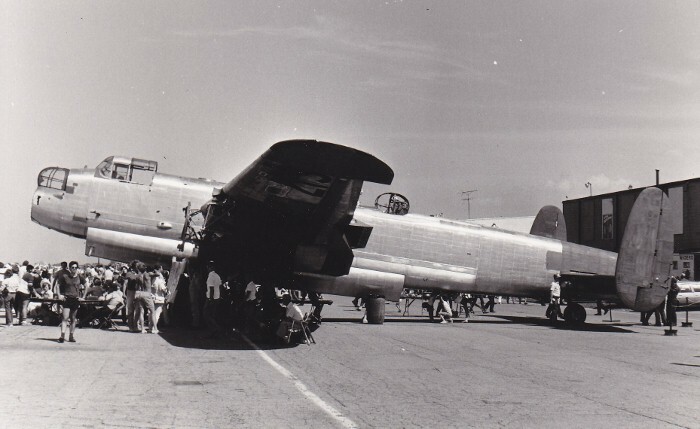 What is surprising is that such a fine aircraft should have resulted from Avro’s desperate attempts to remedy the defects of its earlier unsuccessful Manchester bomber. 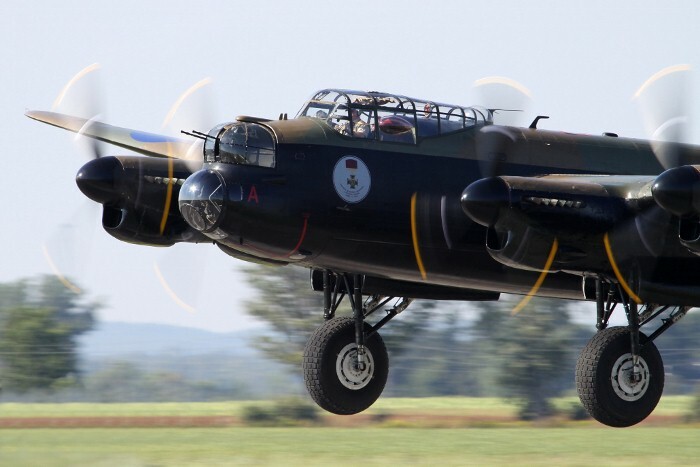 The prototype Lancaster, which flew in January 1941, was a converted Manchester airframe with an enlarged wing centre section and four 1145 hp Rolls-Royce Merlin Xs. The Merlins replaced two 1,760 hp Rolls-Royce Vulture engines, which had proved to be very unreliable. 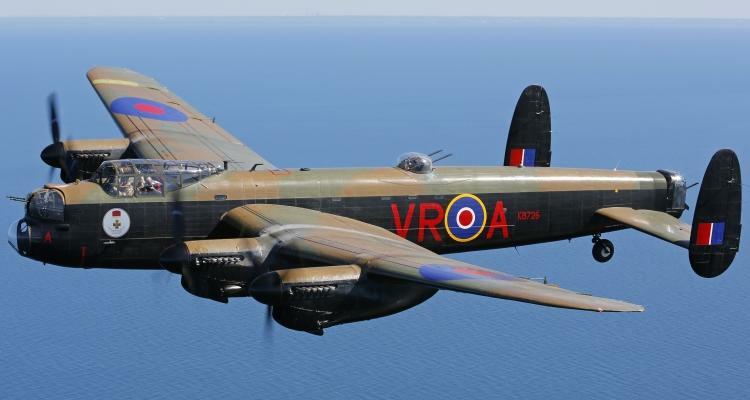 The modifications were an immediate success and such was the speed of development in wartime the first production Lancaster was flown in October 1941. RAF No. 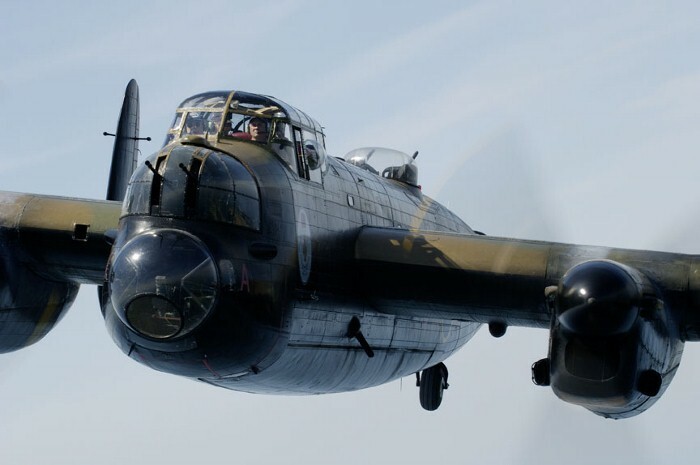 44 Squadron was the first to be fully equipped with Lancasters, notching up another first when it flew them operationally over Heligoland in March 1942. 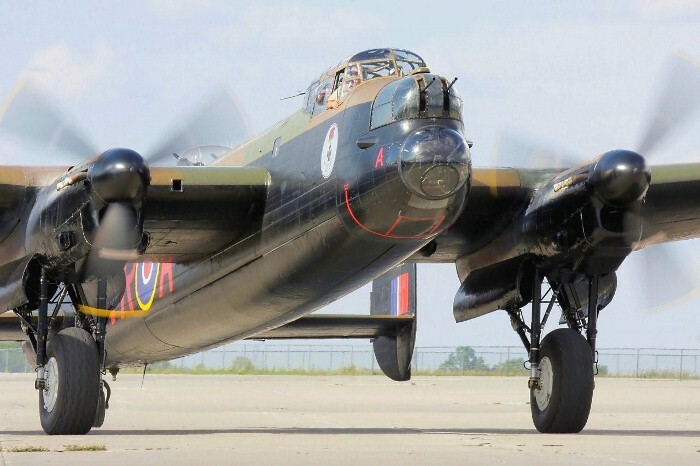 The Lancaster could carry a huge bomb load. 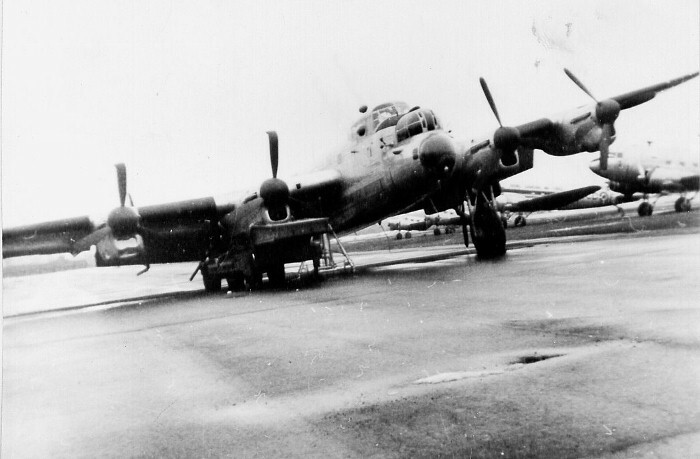 It was the RAF’s only heavy bomber capable of carrying the 12,000 lb “Tallboy” and 22,000 lb “Grand Slam” bombs. 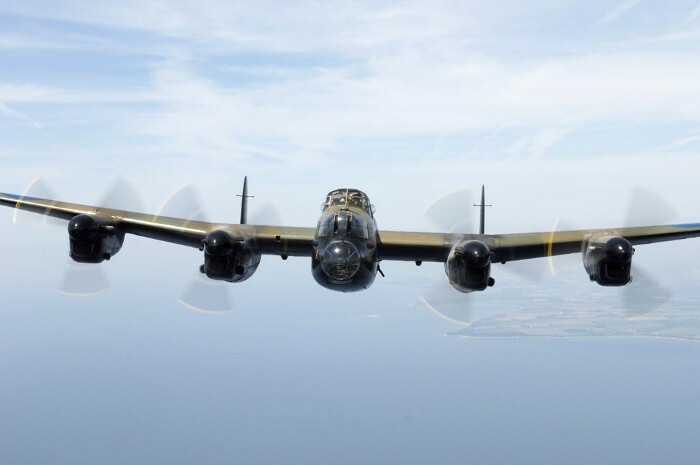 The aircraft won a place for itself in history, with the daring and precise bombing raids on the Ruhr Dams, in May 1943 and with the sinking of the German battleship Tirpitz, in November 1944. 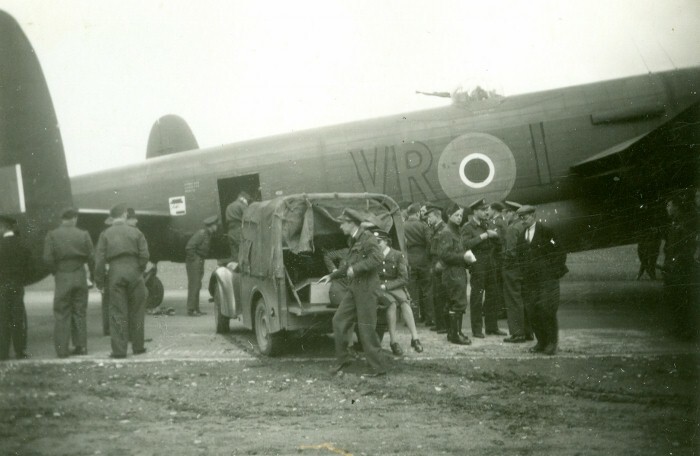 Thousands of Canadian airmen and ground crew served with RCAF and RAF Lancaster squadrons in England, during the war. By late 1944, the Canadian No. 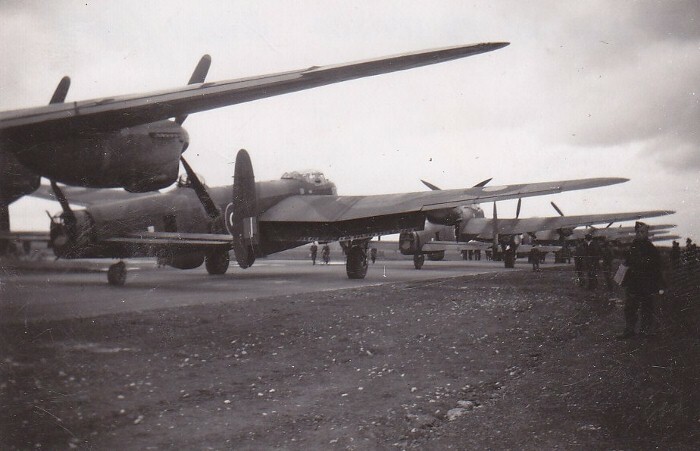 6 Group of Bomber Command operated thirteen squadrons of Lancasters in the war against Germany. 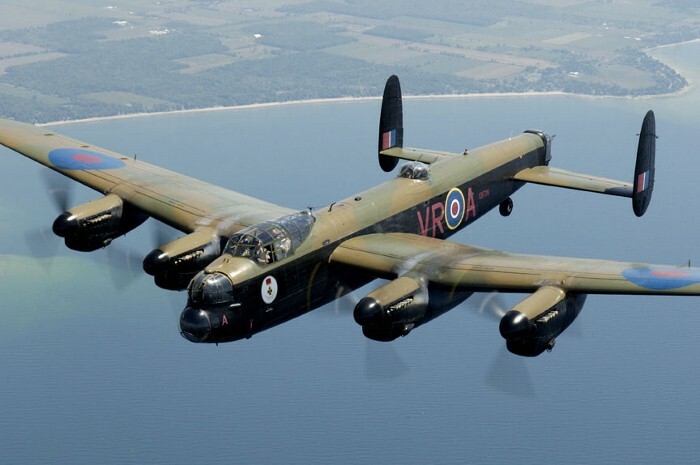 At home, thousands more Canadians worked at Victory Aircraft in Malton (Toronto) to produce 430 Lancaster Mk. Xs, between 1943 and 1945. 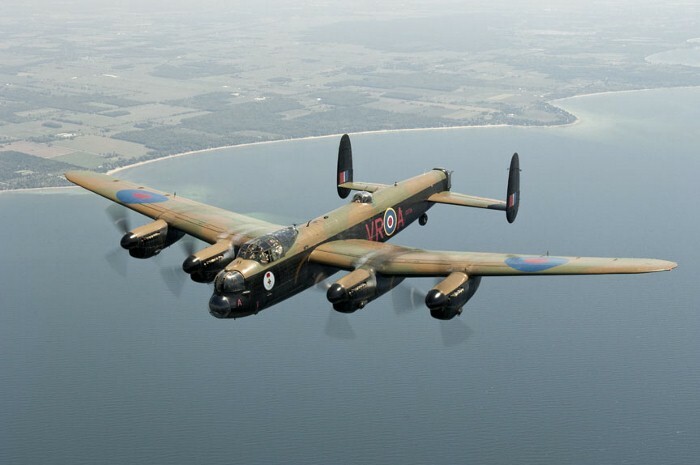 After WW II, about 230 Lancasters served with the RCAF in several roles including, Arctic reconnaissance, maritime patrol and as a bomber. 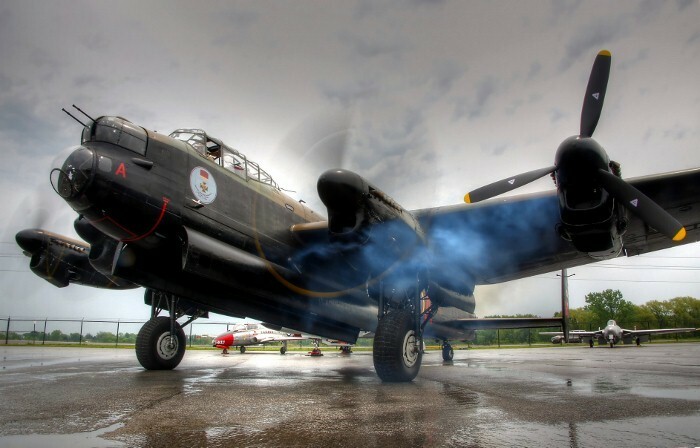 The Lancaster was ceremonially retired from the RCAF at Downsview (Toronto) in April 1964. 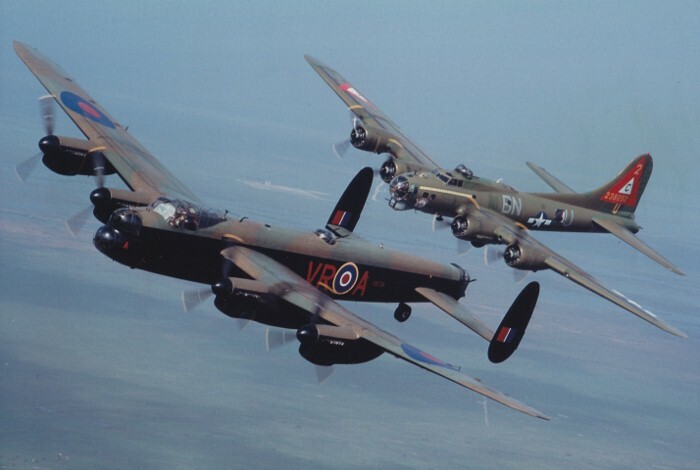 In total 7,377 Lancasters rolled off the production lines in Britain and Canada, during WW II. 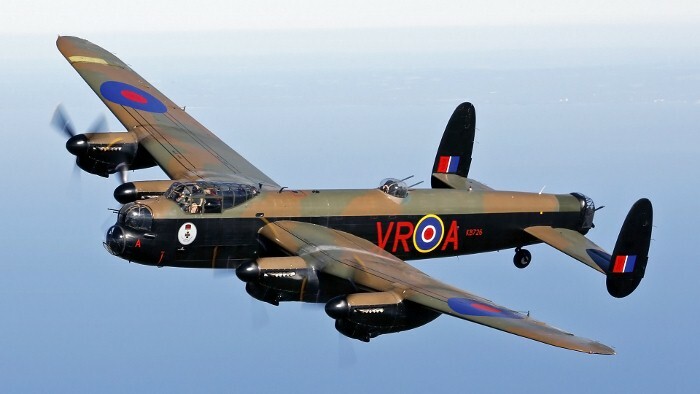 Today, 17 Lancasters survive around the world, but only two are in flying condition. 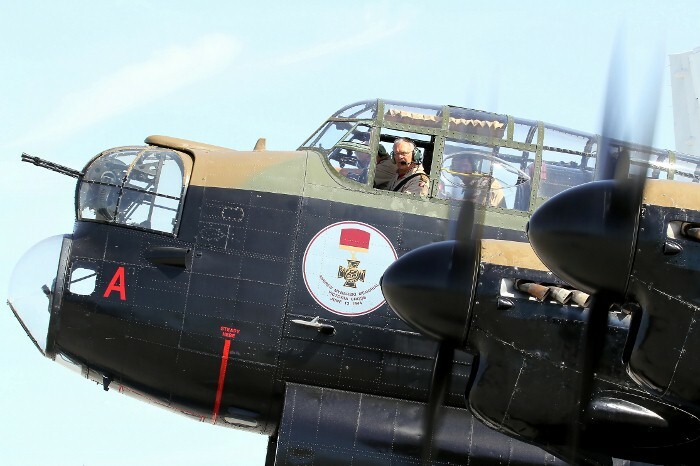 The Museum's Lancaster Mk. 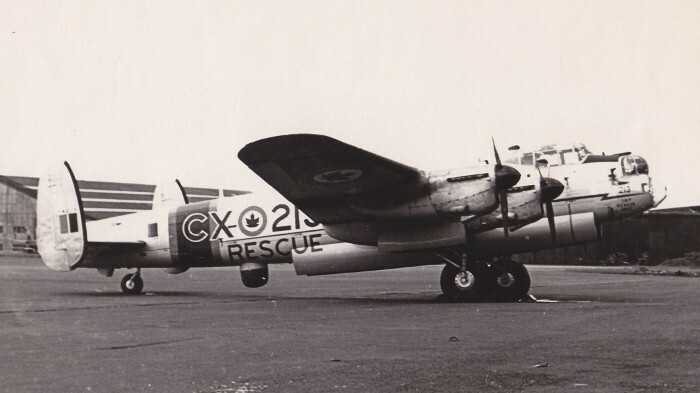 X was built at Victory Aircraft, Malton in July 1945 and was later converted to a RCAF 10MR configuration. 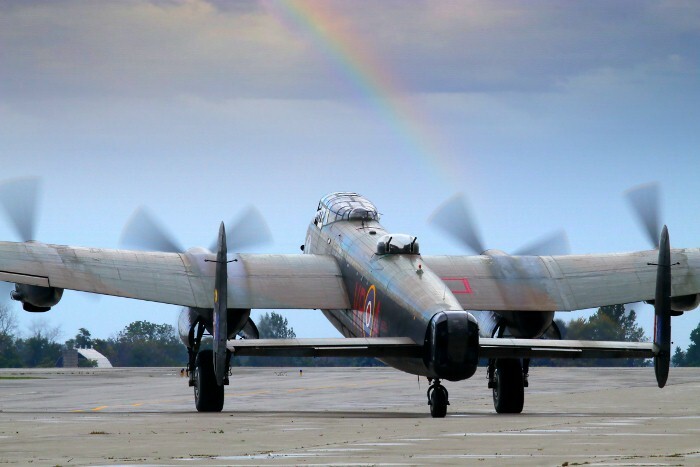 In 1952, it suffered a serious accident and received a replacement wing centre section from a Lancaster that had flown in combat over Germany. It served as a maritime patrol aircraft, with No. 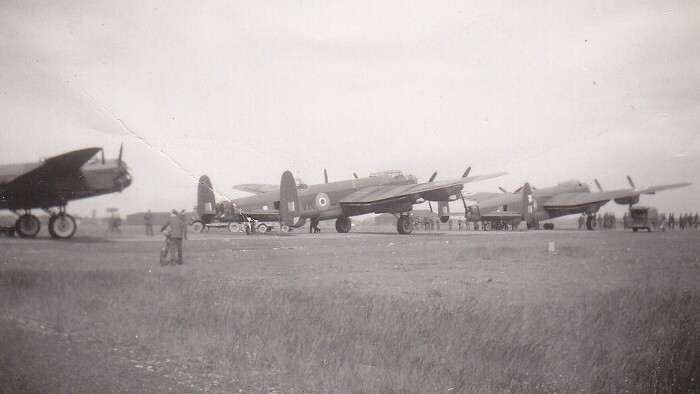 405 Squadron, Greenwood, NS and No. 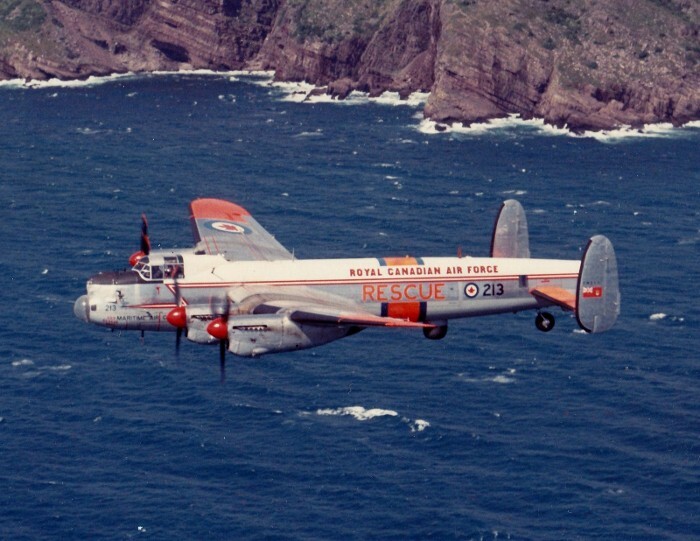 107 Rescue Unit, Torbay, Newfoundland for many years and was retired from the RCAF in late 1963. 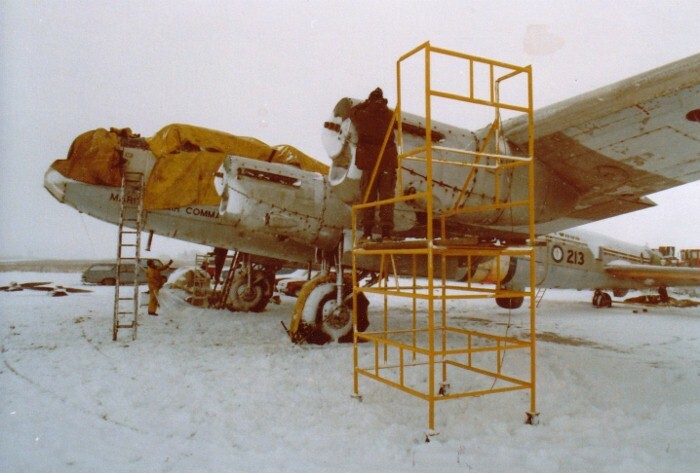 With help from the Sulley Foundation in 1977, it was acquired from the Royal Canadian Legion in Goderich, Ontario, where it had been on outside display. Eleven years passed before it was completely restored and flew again on September 24, 1988. The Lancaster is dedicated to the memory of P/O Andrew Mynarski and is referred to as the “Mynarski Memorial Lancaster”. 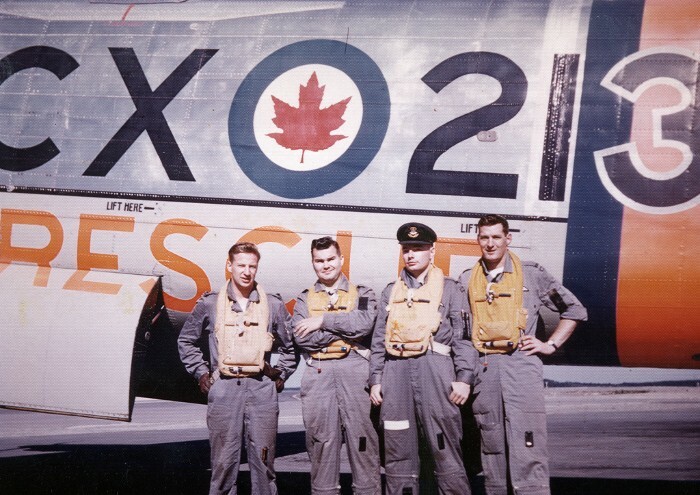 It is painted in the colours of his aircraft KB726 – VR-A, which flew with RCAF No. 419 "Moose" Squadron. 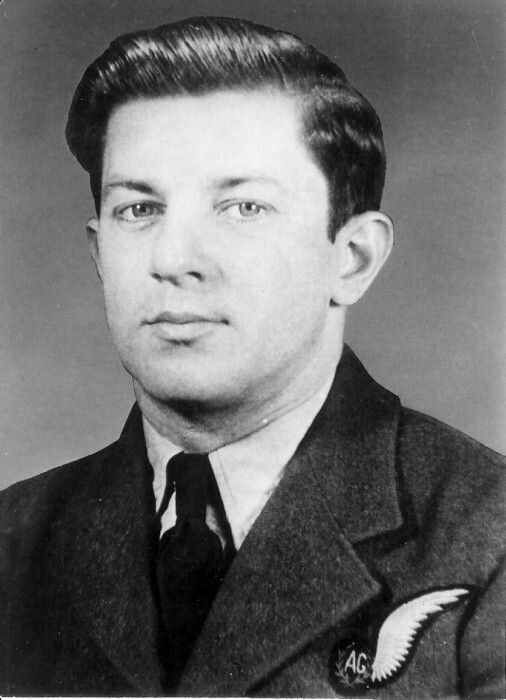 Andrew Mynarski won the Victoria Cross, the Commonwealth’s highest award for gallantry, on June 13, 1944, when his Lancaster was shot down in flames, by a German night fighter. 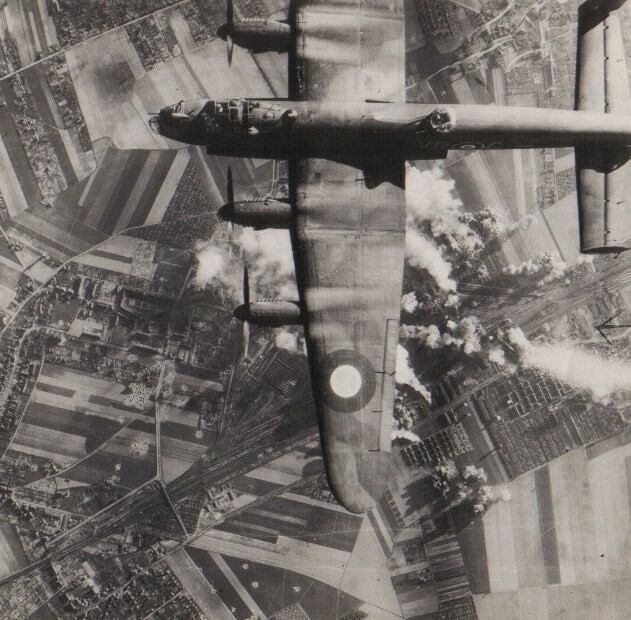 As the bomber fell, he attempted to free the tail gunner trapped in the rear turret of the blazing and out of control aircraft. The tail gunner miraculously survived the crash and lived to tell the story, but sadly Andrew Mynarski died from his severe burns.